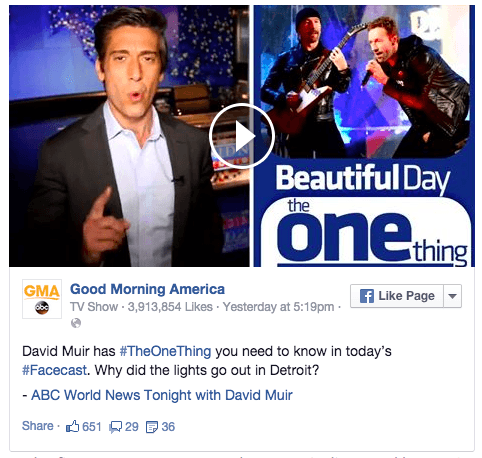 ABC World News Tonight with David Muir is debuting #‎TheOneThing‬ Facecast, a one-minute newscast produced exclusively for Facebook. In the newscast, Muir shares a roundup of the top news stories and trending topics for the day in an abbreviated, snackable format. While ABC certainly is not the first news outlet to develop a newscast specifically for social media, what’s exciting about this initiative is the format, reach and what the combination reveals about success with Facebook video. Post by Good Morning America. In the first newscast on December 1, Muir discussed hot topics of the day, including Ferguson, Cyber Monday, Girl Scout Cookies, and more in just over one minute. The result at press time? Over 100,000 views – and counting. The second newscast has generated 84,000+ videos at press time, in which Muir discussed a major power outage in Detroit, fears over mudslides in California, the World AIDS Day concert in New York City, and more. In reviewing both editions of the #TheOneThing‬ Facecast, it’s clear that the brief, easy to digest format works. Both videos clock in at around one minute and 20 seconds. Also, the editing, flow from one news story to the next and copy work well together at a pace that is both easy to understand while keeping the viewer’s attention. The end result serves as an easy way to absorb some of the key news headlines of the day in a very short amount of time. While the end result is engaging and well-produced, it would be interesting to learn if video ads played a role in amplifying reach and views on Facebook. While Facebook announced in September that it delivers 1 billion video views per day, it also has a number of video advertising solutions, including ones that specifically target views, or the number of times a video will be shared with fans. On ABC’s World News Tonight Facebook page, compare the #TheOneThing‬ Facecast video posts to other posts on the page and the results for the directly uploaded video posts are much stronger when compared to other types of posts, or links driving to abc.go.com (with the caveat that we aren’t privy to click-thru rates). What has your experience been with video posts on Facebook? Leave a comment below and share your best practices.